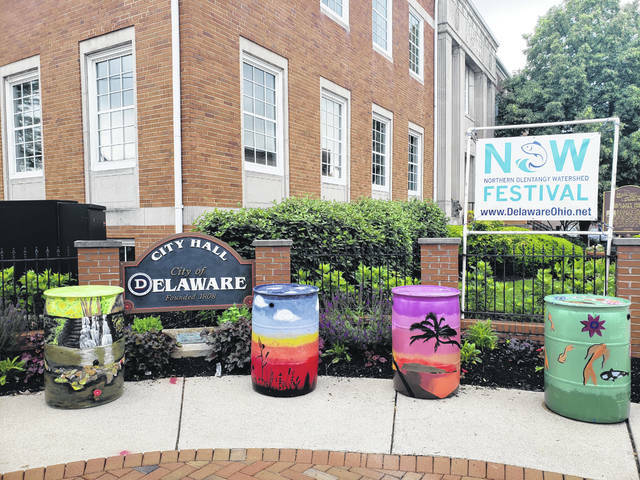 Rain barrels and a sign promoting the upcoming fifth annual Northern Olentangy Watershed (NOW) Festival are on display outside Delaware City Hall at the corner of South Sandusky and East William streets. The city reports the majority of rain barrels were painted by local school districts throughout the upper Olentangy Watershed, and the barrels will be raffled off at the event with the proceeds going to improve the Olentangy Watershed. The City of Delaware is hoping the fifth annual Northern Olentangy Watershed (NOW) Festival on June 16 will give the community a chance to learn about local water and have a good time. The festival is organized by the City of Delaware and is designed to encourage land and water stewardship and provide natural resource education to communities throughout the Olentangy Watershed, according to Lee Yoakum, community affairs coordinator for the city. The event will run from noon to 3 p.m. on Saturday, June 16, at Mingo Park, 500 E. Lincoln Ave. The NOW Festival will feature family-friendly activities, several natural resource information booths, live river critters, food trucks, and a rubber duck race down the scenic stretch of the Olentangy River. Yoakum said the event falls on the anniversary of the National Scenic River Act that was passed in Ohio in 1968. The act designated over 60,000 miles of rivers and streams in Ohio, including 22 miles of the Olentangy River from Delaware Lake Dam to Wilson Bridge Road, just inside Franklin County. City of Delaware Watershed & Sustainability Coordinator Caroline Cicerchi said the festival first began in 2014 after the city was awarded an Ohio Environmental Protection Agency (OEPA) Environmental Education Fund grant. Tickets for the rubber duck race can be purchased during the festival. In the event of unsafe river conditions, the duck race will be postponed to June 17 at 2 p.m. at Mingo Park. Proceeds from the race go to Sustainable Delaware Ohio. ODNR will be conducting a stream quality monitoring workshop in the river just south of the Jack Florance Pool. Those interested in participating and learning about the health of the river should wear shoes and clothes that can get wet, the city reports. Yoakum said thanks to the generosity of local sponsors, there will be several items available during a free raffle at the end of the festival. Prizes include outdoor gear from R.E.I., Florance Pool passes, native seed packets, garden accessories, gift cards, wildlife guides and more. There will also be a rain barrel raffle, with over a dozen rain barrels available. Tickets will be sold throughout the festival. The majority of rain barrels were painted by local school districts throughout the upper Olentangy Watershed. Proceeds from the rain barrel raffle go to improvements to the Olentangy Watershed. In the event of rain, the festival will be moved into the gymnasium at Mingo. Additionally, two free canoe floats will take place during the festival in coordination with ODNR’s Scenic River Program. The floats will begin at Mingo Park and end at Cherry Street with transportation and equipment provided. Participants under 18 must be accompanied by an adult. Registration is required and can be found on Eventbrite titled, “NOW Festival Olentangy River Float” (https://www.eventbrite.com/e/now-festival-olentangy-river-float-tickets-46732629553 ). The first float will run from 10 a.m. to 12 p.m. and the second from 12 p.m. to 2 p.m., approximately. In the event of inclement weather or high river levels, the floats will be canceled.